Long before Baoyan bricks, there was the original ODB. Wasn't it Shakespeare himself who once famously explained this as being, "Cuz there ain't no father to his style"? These two angry gentlemen came from Beijing Taochaju, from my last trip to Maliandao. 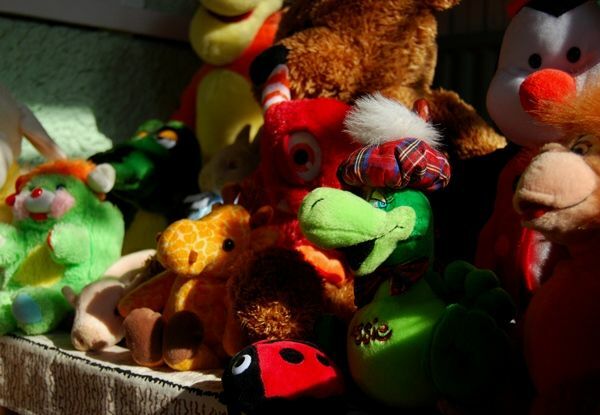 I've written before about my success with "The Friend Method" of obtaining good prices (listen to the price that the seller is giving his friend), which is a card that should be played with caution, depending on the audience. It worked out well in this instance, because these wrapper-less fiends were thus priced at a humble 200 RMB. We drank these quite a bit, the owner (Yunqing), the friend, and I. For 200 RMB, I was expecting ungood tea. However, the results were pleasantly startling. 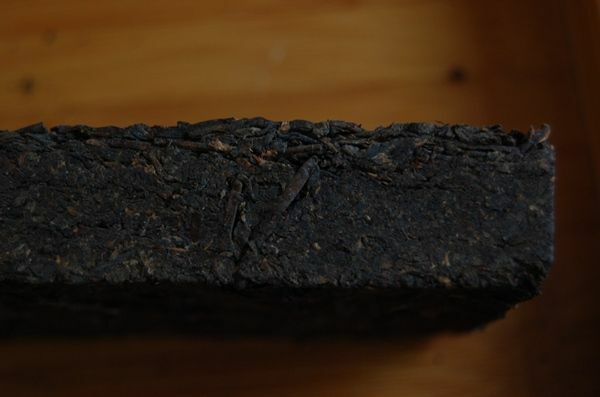 Yunqing pointed out that the leaves are small and chopped throughout the majority of the brick, with the thinnest imaginable layer of large leaves on the facia. Shown below, the brick in cross section, where the upper plane represents the front of the brick, with its slim layer of big leaves. Now at home, I wished to try some of the chopped leaves, rather than concentrate on the covering of larger leaves, and so hacked into one corner. The brick duly relinquished, with some reticence, a number of nuggets, as pictured below. You'd think that such a tea wouldn't be up to much, but the results are much better than that. 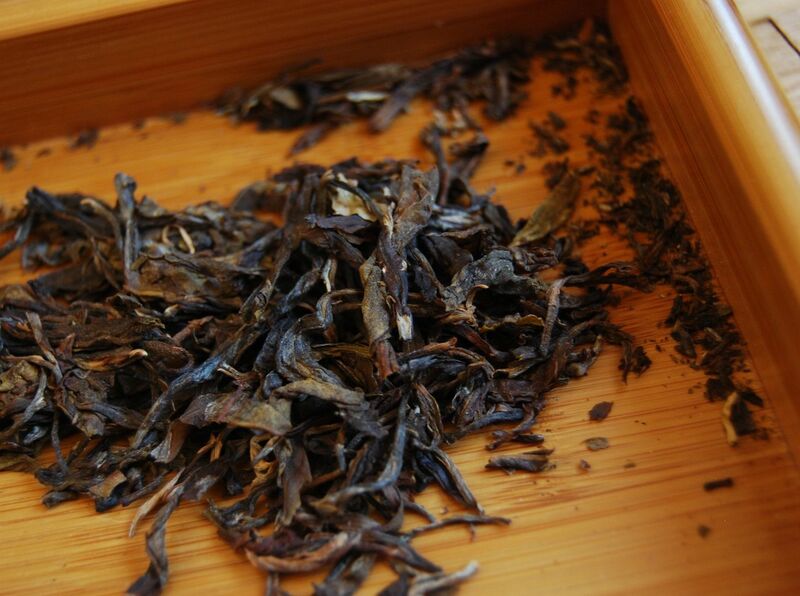 Even the very first brew, which you expect to be watery because the leaves remain in their little chunks, was thick and darkly coloured (shown below). Yunqing did us a huge favour at selling these for such a modest price, and I feel very grateful, enjoying them back at home. Later infusions build, constructing an ever-darker, ever-sweeter brew. 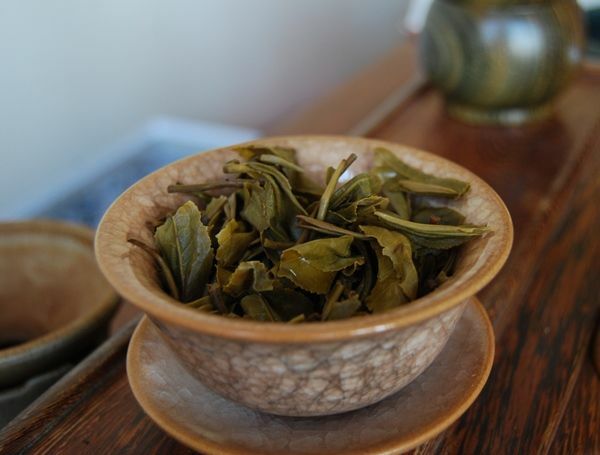 I come back later in the day (a rare treat to enjoy tea, let alone in the evening) in order to give the leaves the full amount of time that they deserve: after twelve infusions, the brews are still thick, sweet, and powdery. When even humble leaves such as these can be aged to give such a decent result, I am heartily cheered. 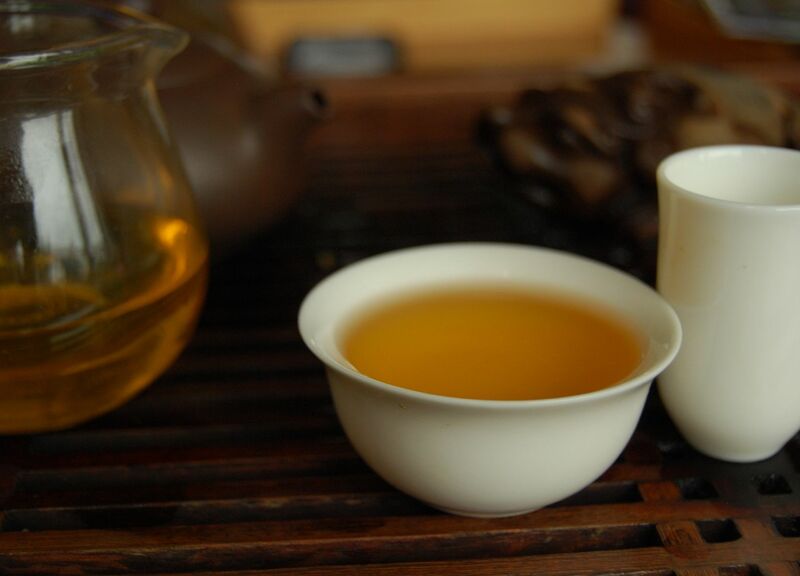 It is 4 a.m. at the time of enjoying this tea, where the term has just begun following the long, productive summer. I expect the first infusion of this tightly-compressed tea to be weak, but it is, on the contrary, thick and heavy with vanilla. The powdery-sweet character of bookish old pu'ercha is a surprise. Spring water brings out a brighter, clearer, and more well-defined tea than the initial infusion with filtered tap water. 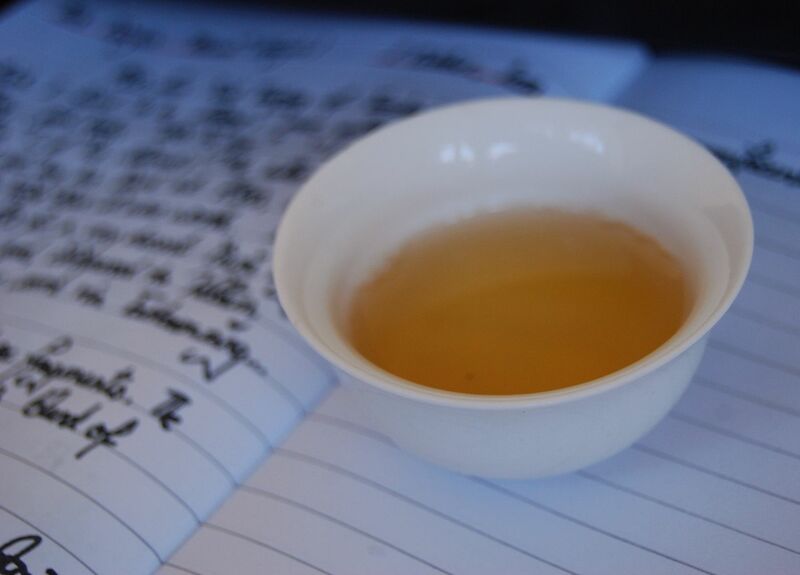 By the third infusion, the sweet vanilla has taken the fore, where the scent in the wenxiangbei is long and active. The soup has darkened to a heavy red-brown and looks the part. 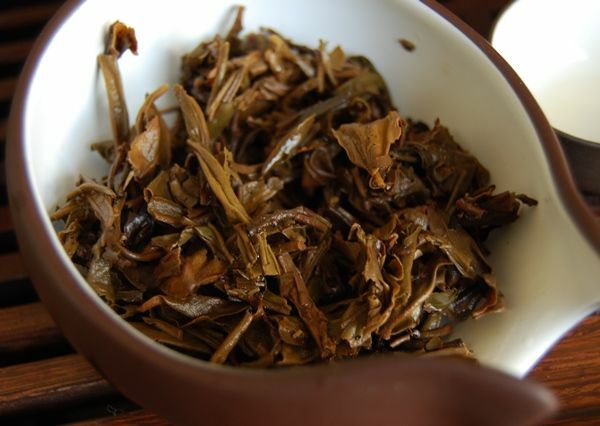 By the fourth infusion, it reaches maximum strength, where all the leaves have separated from their tightly-compressed nuggets. It lasts well and has an energy that I would not expect for zhuancha. I wrote this article sometime before Christmas - Blogger has a convenient function by which one can "queue" items for publications in advance. However, the subject of this piece is quite relevant to the season: it is on the topic of gift-giving. After my graduation this year, I took a short (business) trip to Beijing. 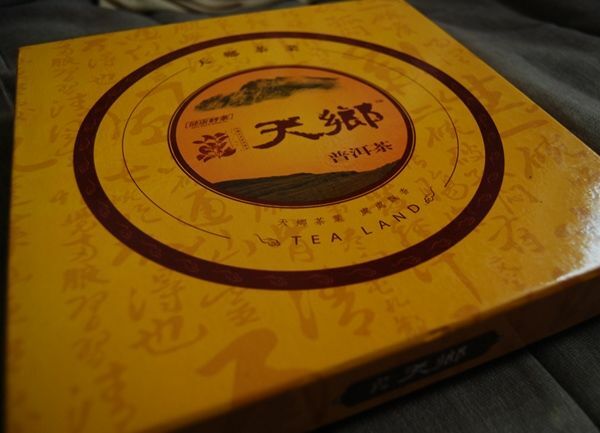 While I was there, Lei's "biaojie" [elder female cousin] very kindly sent a huge package of snacks and tea from her home, in Shanghai, to my hotel in Beijing, the Cuigong Fandian (highly recommended if you're in the university district, Zhongguancun). The porters gave me an alarm call by telephone, which came as quite a surprise, as I had only got to bed perhaps five hours before. This was to ensure that when they knocked on my door, I was at least conscious. Opening the enormous box, which had been express-delivered in under 24 hours, I was struck by the generosity of Lei's cousin. Particularly aimed at me, two cakes pu'ercha were included: shengpu and shupu. Both came in large ceremonial-style gift-boxes, as shown above. The cake's name is "Jiulong" [literally "nine dragons", but probably referring to the Kowloon area of Hong Kong] "Tianxiang" [literally "heaven hometown"]. 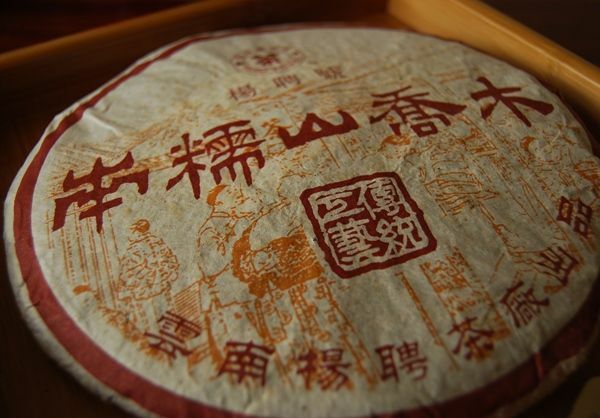 Fengqing is a properly old tea company, who made the first dianhong [delicious Yunnan red tea], and who subsequently diversified into pu'ercha. 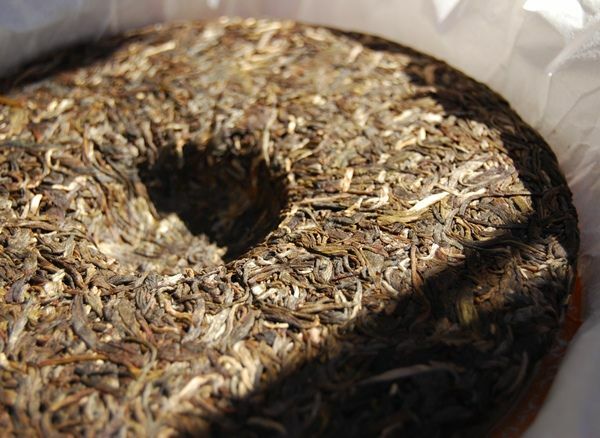 Their skills with tea are amply demonstrated by the charming, slightly loose, cake pictured above, which gives rise to a selection of pretty-looking leaves, as shown below. It is at this stage that the alarm bells start to ring. The cake smells unmistakeably of rubber - specifically, bicycle tyres. 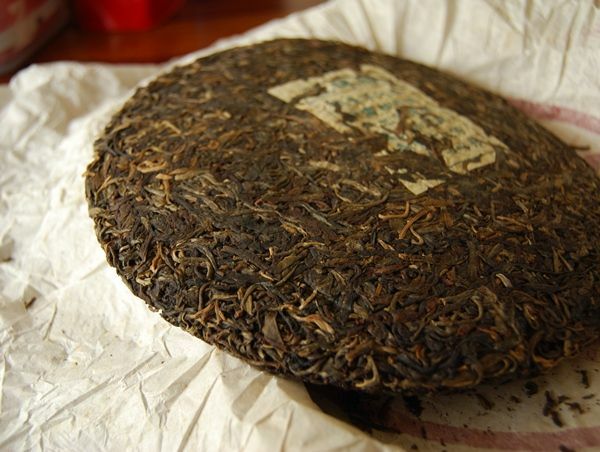 Sadly, this continues into the wenxiangbei [aroma cup], where I can tell that there is thick, active scent, but it is completely obscured by the scent of tyres. 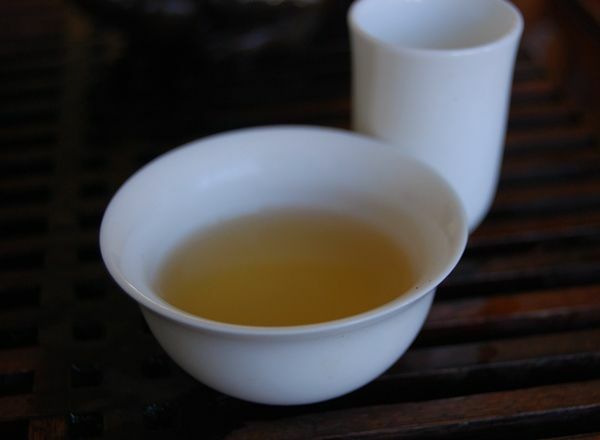 Then, in the pinmingbei [drinking cup], there is only a sharp, acrid, chemical tang, and the ubiquitous scent of tyres in the nose. My dear wife takes a sip to confirm my findings. Before one tiny cup is finished, the bing is sitting in the compost bin in the garden. 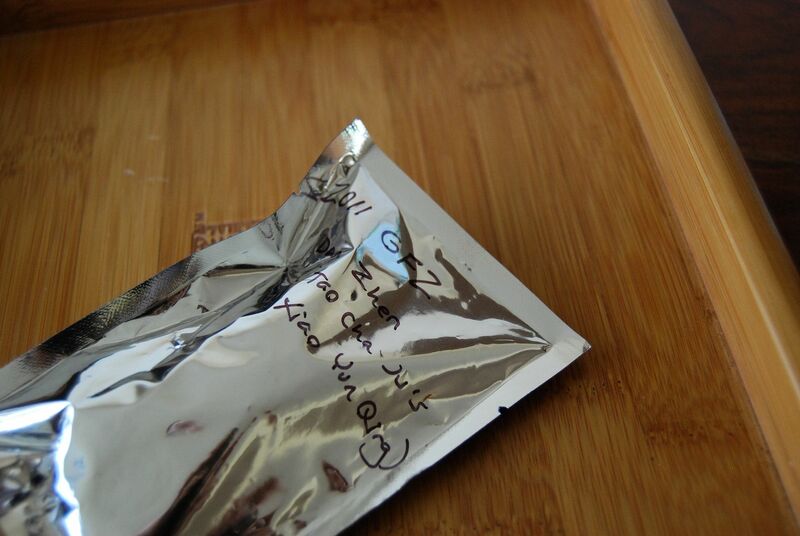 The entire bing, its wrapper, and even the glossy box, have the same deep-seated chemical scent. 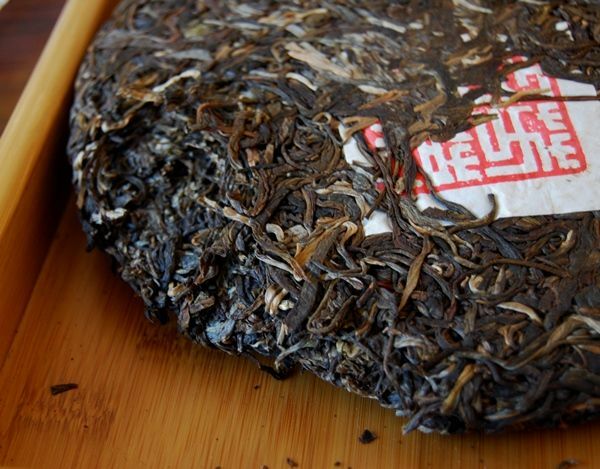 Unfortunately, the shupubing, pictured above (also "tianxiang") suffers the same fate. Such are the dangers of gift-giving, and of gift-receiving. Someone, somewhere, has stored this pair of cakes in an unsuitable environment. It is a great pity that their fate is now to be taken away by the local council and turned into biomass. I won't tell Biaojie if you don't. In the chaos of Michaelmas term, I always forget how much more exacting is the process of interviewing prospective students, which takes place after the end of term. Interviews at our little university have rather a special place in the public eye, and there is extreme scrutiny from the press (which is, probably, a healthy activity). The original field of applicants contains many thousands of hopefuls, which are whittled down to a short-listing of 406 interviews. These interviews take place over five days, with each candidate being interviewed by two different colleges. Ultimately, my colleague and I have to pick six candidates to admit for our college - tutors at the other twenty or so colleges are doing the same. Given the critical nature of the proceedings, it is a duty that the university tends to take very seriously, to which we have to commit roughly one-to-two weeks of working time. At the end of it all, tea looks very appealing. I tried this cake during both visits to Fangmingyuan in my recent trip to Beijing, and each time I remember being genuinely impressed. How will it translate into its new English home? The wrapper is similar to the 2009 Jingmai in style and colour - orange and chunky. As with the Jingmai cake, it is very pretty to look at. I appreciate the large leaves, and especially enjoy the fragrance, which is heavily sweet. Just as in Maliandao, the soup turns out to be a satisfying clean yellow. As more of it gathers in the gongdaobei, it darkens into a solid orange, as pictured below. 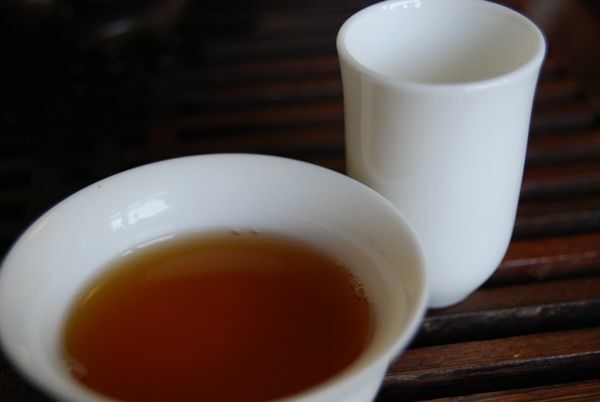 "Very good tea", comments Lei, as she interrupts her own teapot of English Breakfast to take a cup of this Nannuo. Immediate impressions include the cooling nature of the soup on the lips and tongue, and its thick body that fills the mouth. 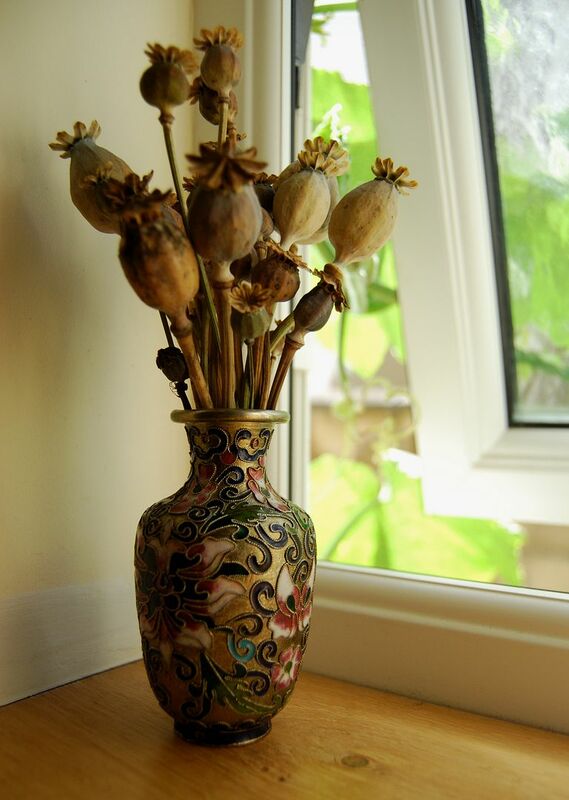 It is floral, in a manner that I associate with the fragrance used in certain soap. However, it is not a light an ethereal tea: it is solid, has a heavy base of sweetness, combined with a chunky "tea"-like component. 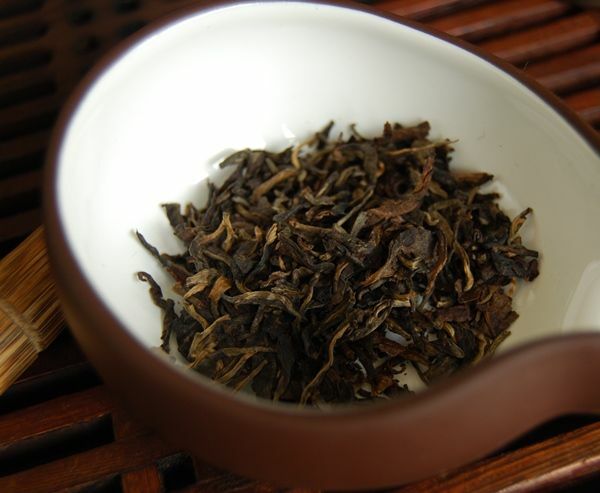 Like many good maocha selections, it has no rough characteristics, but instead provokes a profound mouth-watering as it resonates in the finish. I am quickly reminded why we drank this in Xiaomei's shop. 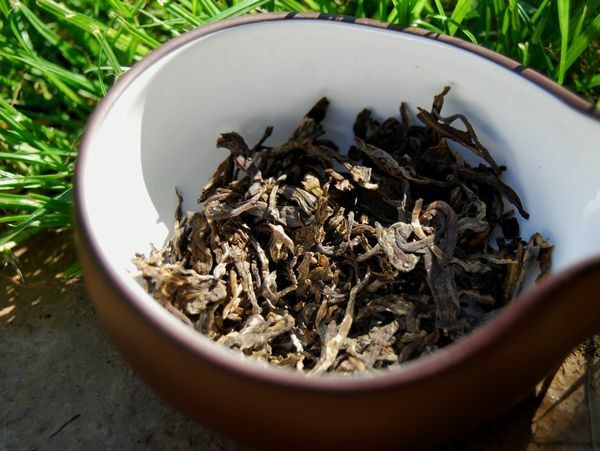 Particularly significant is its endurance: after twelve infusions, it still delivers a potent, sweet, and thick brew, whereas so many lesser teas would have disappeared by the same stage. Testifying to its potency, I keep using "water-in, water-out" instantaneous brews, even after this many. For a young shengpu, it is quite unusual. 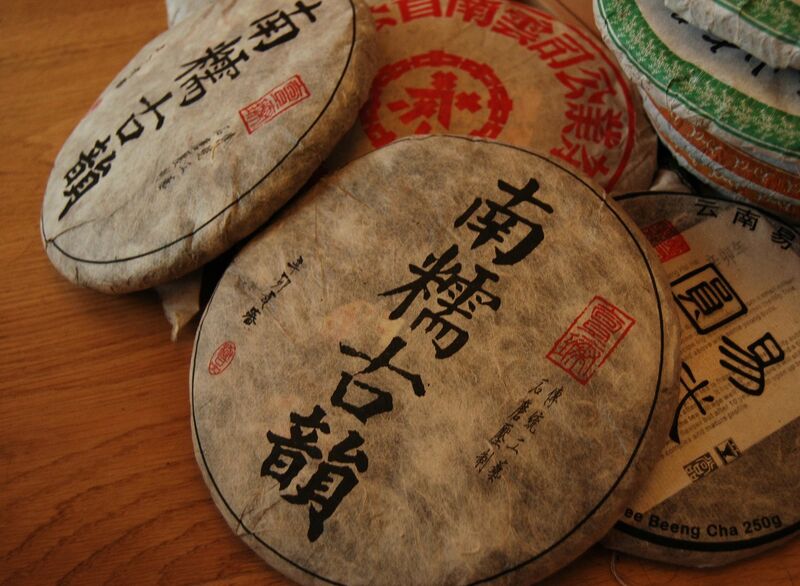 The various Danzhen cakes from this year share the same ability to march on forever without diminishment, which gives me hope for their aging. Delightful. What, then, is the catch? Simply, there isn't one. Xiaodi was very generous in letting me have this for a mere 150 RMB per cake. However, the Fangmingyuan shop on Taobao currently has these listed at 198 RMB, which is a major bargain for such a strong, long-lasting, and enjoyably fat Nannuo. 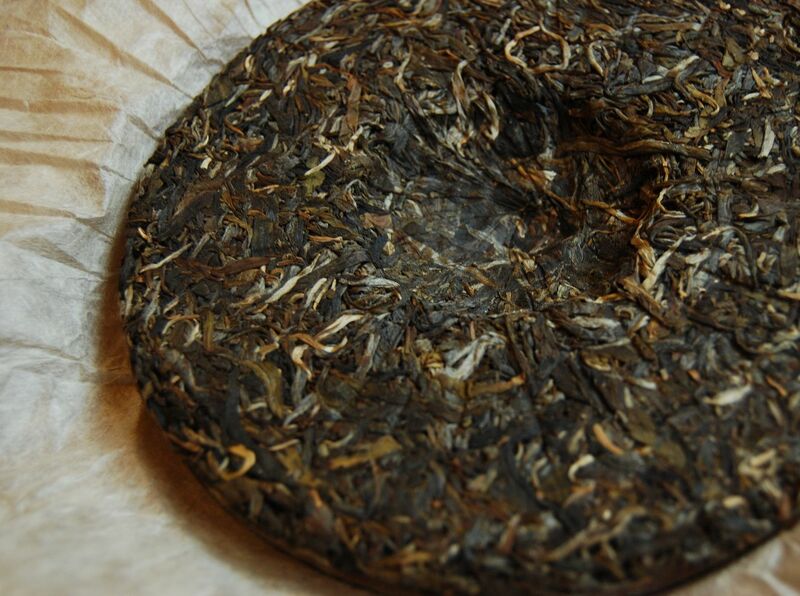 This is the second of two laoshu cakes from Xiao Yunqing, of Beijing Taochaju in Maliandao. Like his other productions, this is both appealing to the eyes and the nose. The fragrance is dense, sweet, and fruity. It is impossible not to fall in love with this cake at the instant of first sight / sniff. We drank this cake only in passing, while I was in Maliandao, after a long day drinking other cakes. Thus, my tea-session at home with this cake was an opportunity to get to know it a little better. In my diary, I wrote "this Nannuo is quite amazing: dense, sweet, floral, fruity. Real pu'ercha." It is definitely that. Plentiful honey dwells in the finish. 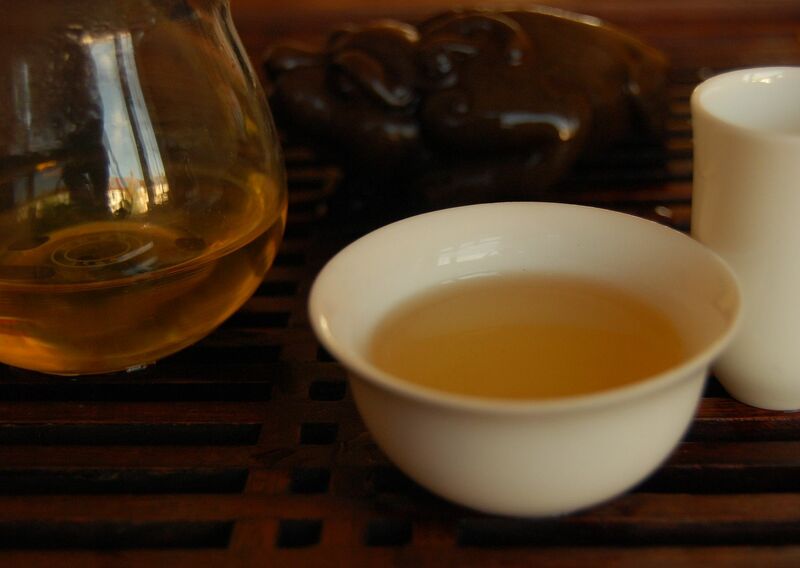 Yunqing emphasised that this was laoshucha [old-tree tea], and, from the soup alone, I am inclined to believe him, even before his open, honest face and constant, gentle enthusiasm for all things pu'ercha wins you over. 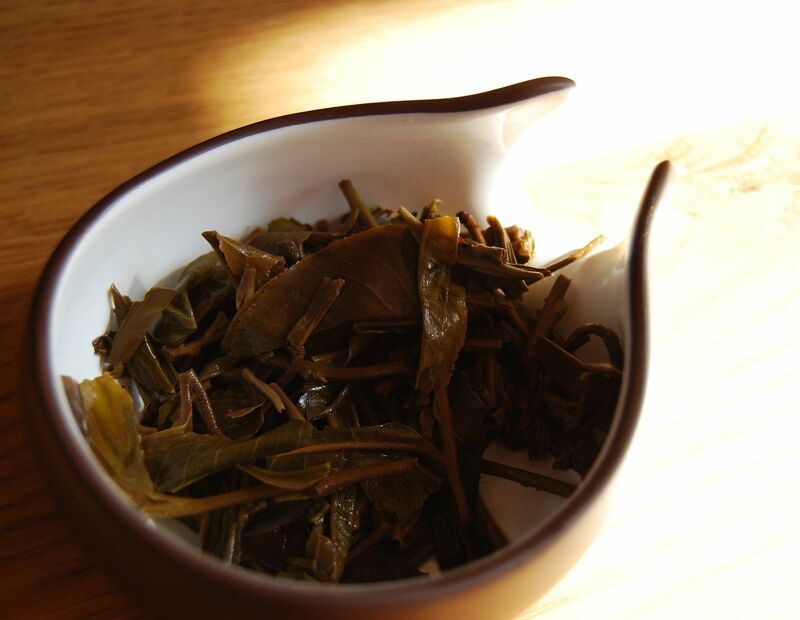 Like most other good laoshu leaves (many of which have come via the generosity of teachums such as KC, Keng, and Nada), this Nannuo is entirely absent any brazen kuwei, but, instead, has a gripping finish that causes the mouth to water profusely. 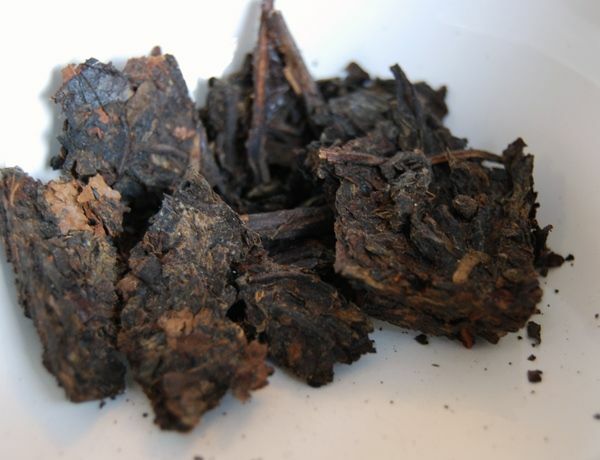 That is not to say it is not bitter - it is, significantly - but it is a different, "cleaner" variety of bitterness that is shared only in those samples of laoshucha that I have tried before. 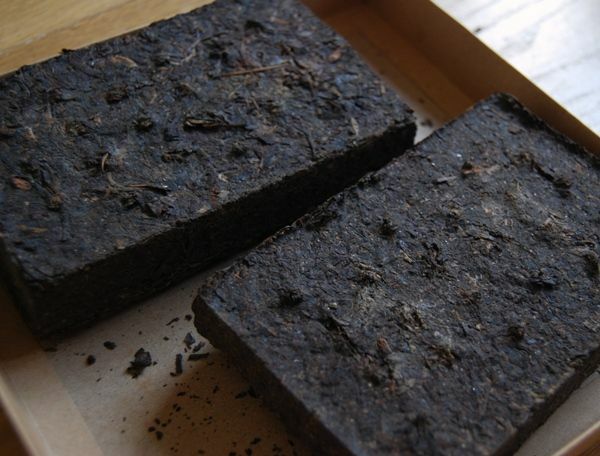 It lasts well, not diminishing through the infusions, but instead staying constant, potent, and strong - again, another sign of tea quality that cannot be approximated by plantation cakes. 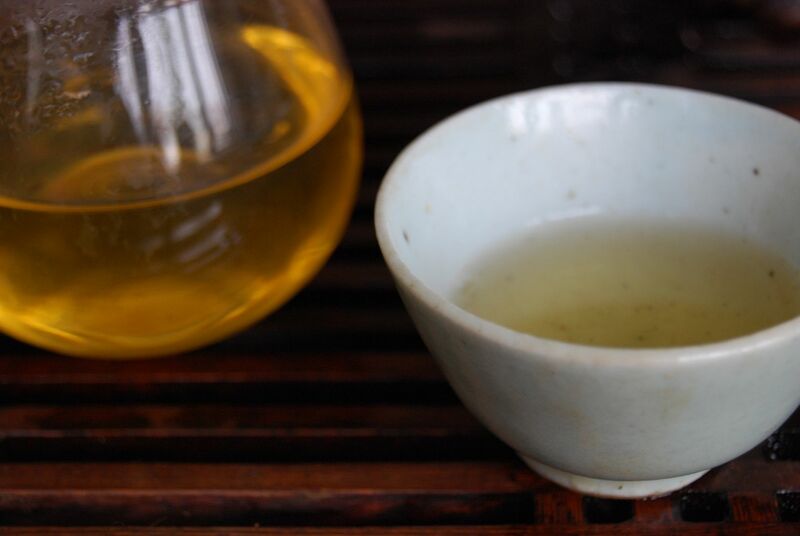 Its endurance really is prodigious for a young tea, as it marches on for over twenty infusions, retaining strength, sweetness, and complexity. Yunqing parted with a pair of cakes for just 200 RMB, which was a great price. I would definitely like to revisit this cake on my next visit to Beijing; perhaps that will be next year, though, by which time he will have made a 2012. 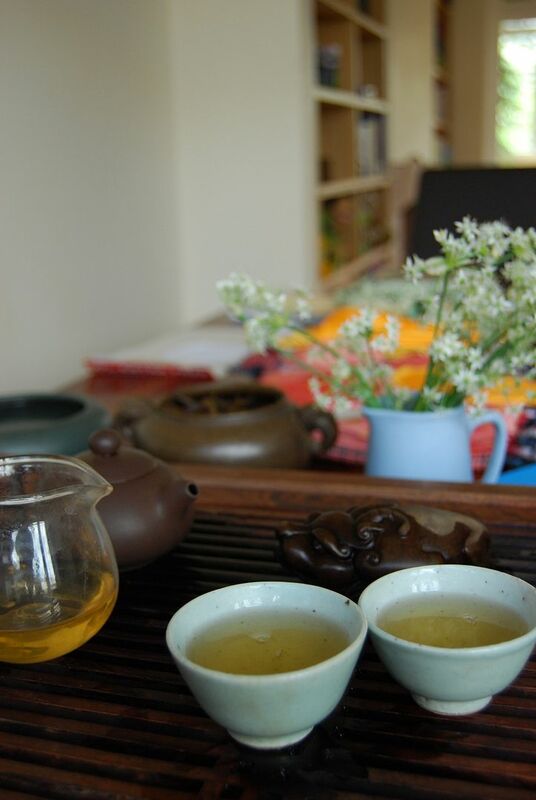 That said, if our university exchange programme continues, perhaps Lei and I will have to go back to Qinghua to conduct interviews... and drink tea. Thanks to white2tea for the sample. The 200 RMB price that Xiao Yunqing kindly gave to me occurred before increases that eventually took it to 300 RMB before it sold out in Maliandao. It seems also to have gone from white2tea, where it sold for just a little over that price (and very reasonably so). "This is good tea", remarked my dear wife. "It has a very broad spectrum", she added. You can tell when a girl has had an education in the physical sciences. 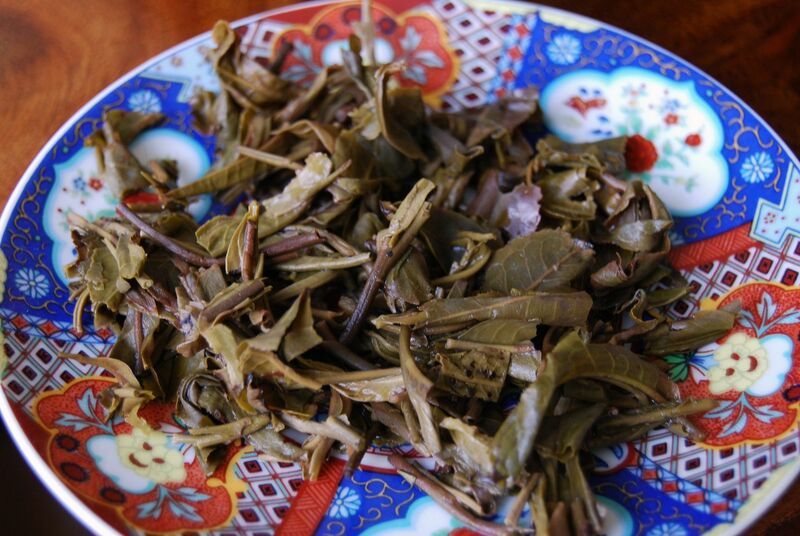 The floral bitterness of young Nannuoshan leaves is obvious in the wenxiangbei [aroma cup]. It builds, slowly, to reveal a strong base of sweetness that appears only after 30s or so. My dear wife's spectral analysis probably took this time-offset into account. The complexity of old honey (which I enjoyed when I tasted this cake before) remains. 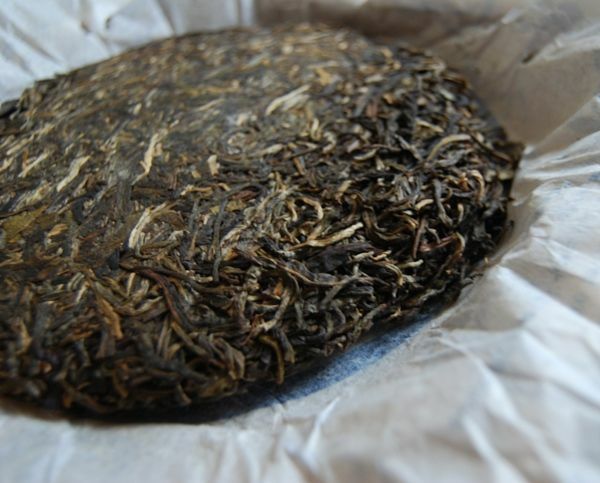 I enjoy the strong, bitter finish, and am reminded of the quality of Xiao Yunqing's cakes. I previously wrote about my long visit to Beijing Taochaju, and its owner, Xiao Yunqing. I've described his rarified, and delicious, Laobanzhang and Guafengzhai, but neither of those exist in anything other than remnants of his single-cake production. This cake is more available, however. Its name is "Banna Guyun", where "guyun" refers approximately to "ancient charm". "Yun" isn't easy to translate, and the "harmony" or "rhyme" translations usually offered are not adequate. A certain age of lady can have "yun", if she has a certain disposition. Chinese is difficult, and, as you will have gathered, I am not skilled. 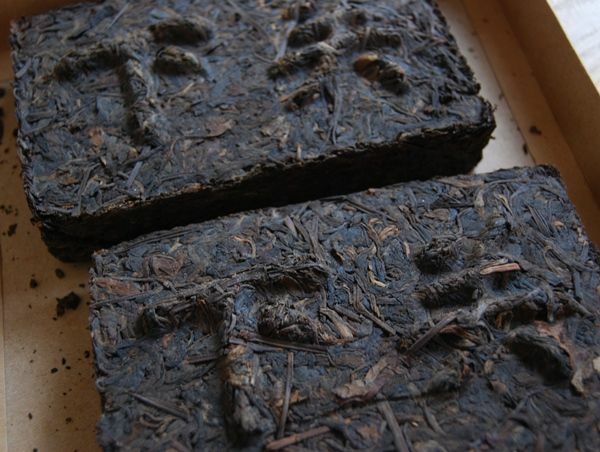 Yunqing made these cakes this year, during one of his apparently frequent visits to Yunnan. If he spends the majority of his time in Maliandao, it must be a slender majority, given his itinerary. When he shows me the photographs of the trees from which he oversaw leaf-picking, I am encouraged. His beaming face is right next to the leaves. Page after page of photographs of... him, with trees. It's a genre of photography that is an acquired taste. We drank this cake quite a bit while at his premises in Maliandao, after lunch. The leaves are large, and strong in structure. 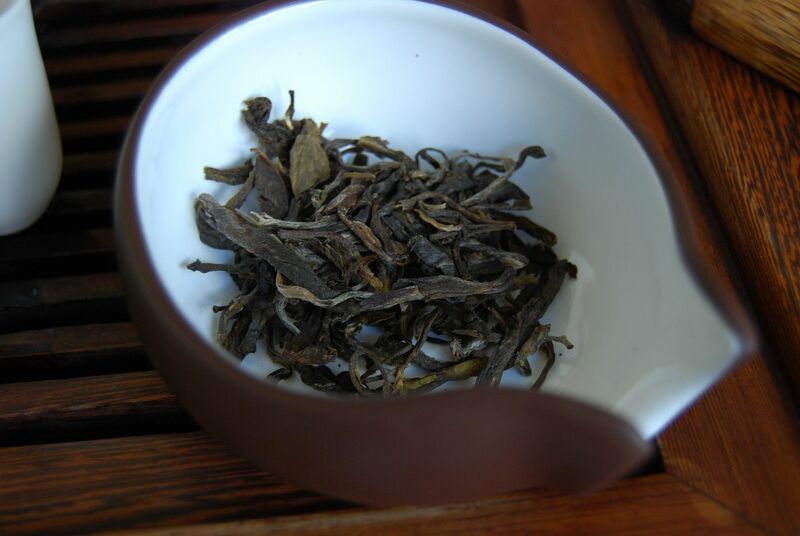 It is a blend of trees from Laoman'e (next to Laobanzhang) and Mengsong. I bought two cakes of this, and relived some of the pleasures of Maliandao by sitting down to drink them in the comfort of my own, while waiting for a coat of woodstain to dry on our staircase. Good times. This is very solid tea. It is dense, very dense, and has a background feeling of old, complex honey. 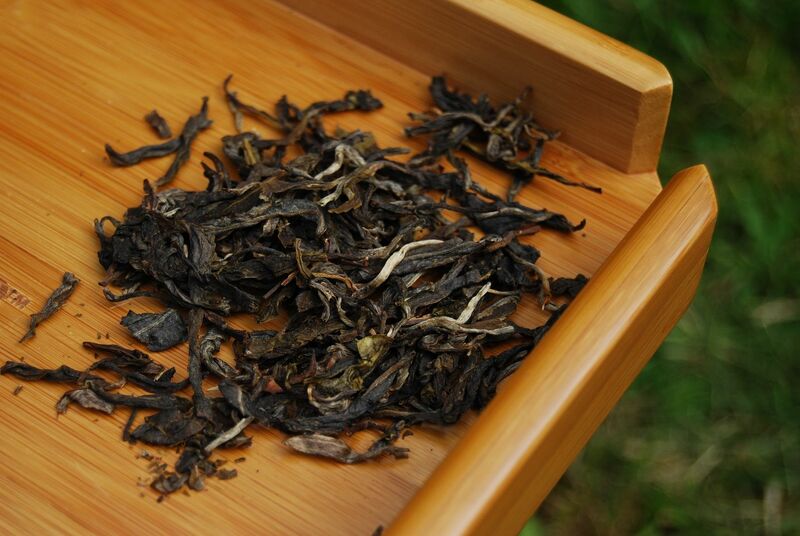 You can imagine the rough sweetness, some dark nuance of flavour, and plenty of strength. 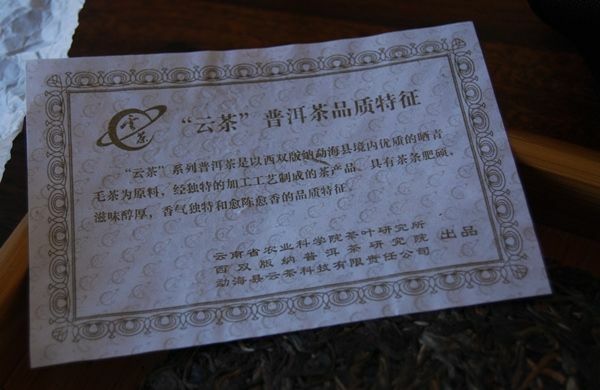 It is also medicinal, in the sense of Chinese medicine. 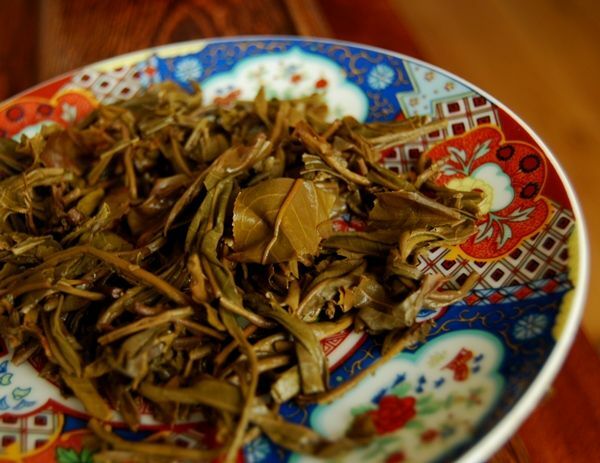 This is A Good Thing; it is a complexity in the character of the leaf that lends itself well to age, in my opinion - it is not a light, floral overtone that might disappear in time, but rather a fundamental part of the base of the tea. It shares something in common with the rather good 2008 Hailanghao "Man'e", back when Hailanghao used to be good. 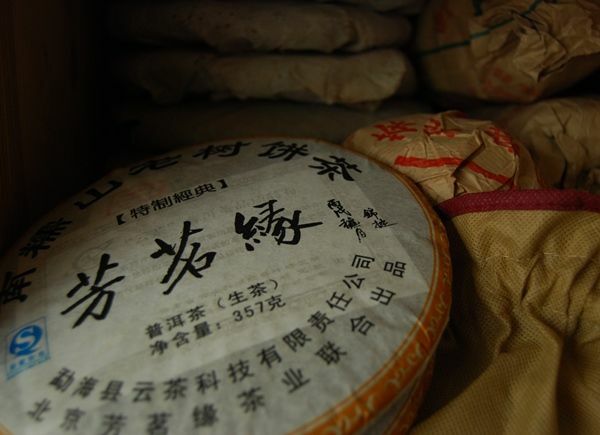 This common character is a broad, sweet, richly fruit-like base, in a dark way, with tons of Bulang-area kuwei [good bitterness]. This cake cost a mere 150 RMB, which, for something of this quality, is a brutal bargain. I couldn't resist it, and it was only my full bags that prevented me from buying more. "I can post you some more", said Yunqing. Tempting... now back at home, I am both happy at my level of discipline in turning him down, and disappointed that I didn't buy a whole tong. His website doesn't yet have these, but he assures me that they are coming. Perhaps I'll just wait until I get back to Beijing. 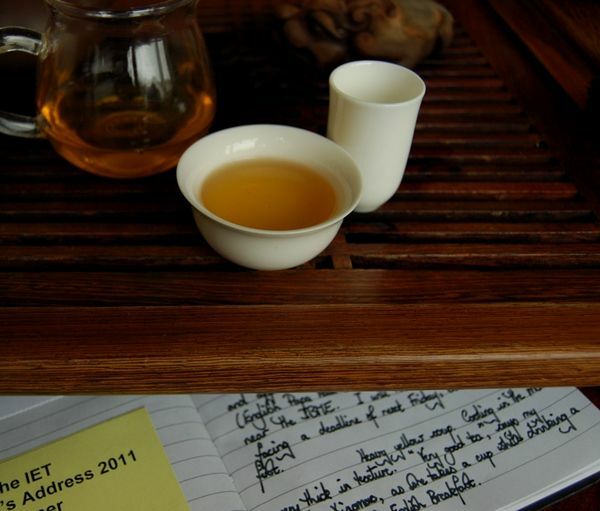 With thanks to white2tea for this sample, let's revisit the Banna Guyun. 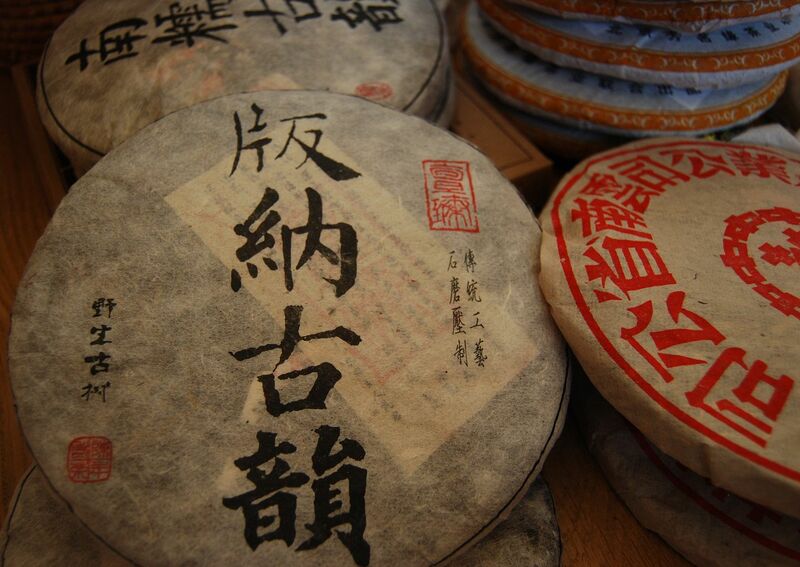 I do rather miss my 150 RMB price, it must be said, but white2tea are selling this at an entirely reasonable price. I suspect that Xiao Yunqing was simply being far too kind when he sold me these cakes in Maliandao. There is sharpness, a broad base, and a long huigan [returning sweetness]. It lasts well, while being properly bitter. I have learned not to try tea while grumpy; the first half of this session (while grumpy) left me ambivalent, while the second session (after a good sleep) reminded me of this cake's many charms. I look forward to seeing how its strong body develops over time. This year's trip to Fangmingyuan in Maliandao was very interesting. Next to the teatable was a cot, in which slept the daughter of Xiaomei, the shop's owner. 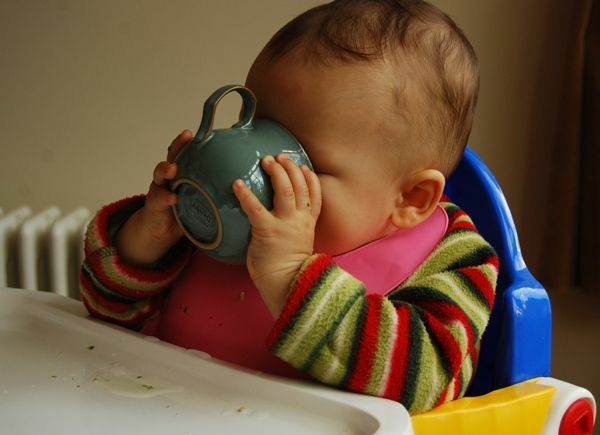 The sweet little baby was initially fascinated by the strange laowai, but then rapidly became bored as the laowai sat there drinking tea, just like everyone else. She slept breathing in the scents of pu'ercha all around. I snuck away from the university I had come to visit in order to return to Maliandao for a second look. Inevitably, this meant calling in at Fangmingyuan again. On the second visit of this trip, Xiaomei's cousin, the owner of a Beijing teashop, was also there. He has lived for some four or five years in Yunnan, and this cake is from his second-favourite area (after Laobanzhang), Jingmai. Jingmaishan is in Lancang county of Simao, just north of Xishuangbanna. 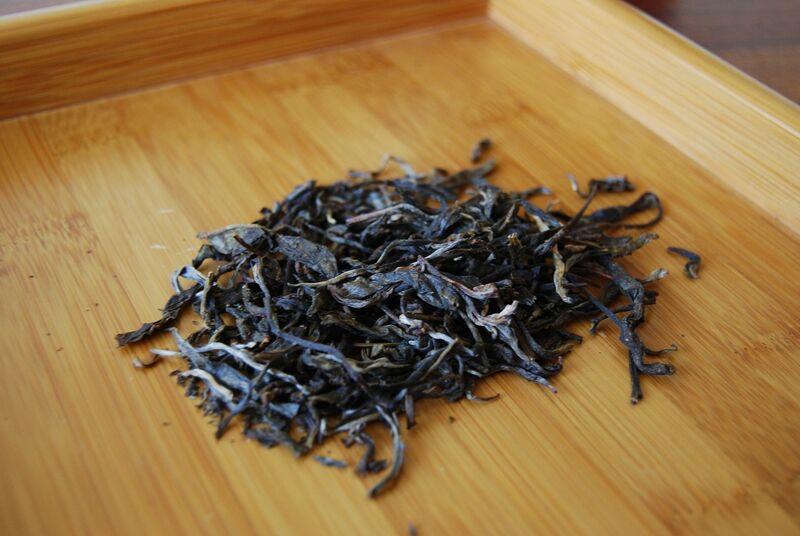 My previous experience with Jingmai has led me to expect a certain "nutty", savoury flavour. As you can see from the above, this cake is made from smaller leaves. 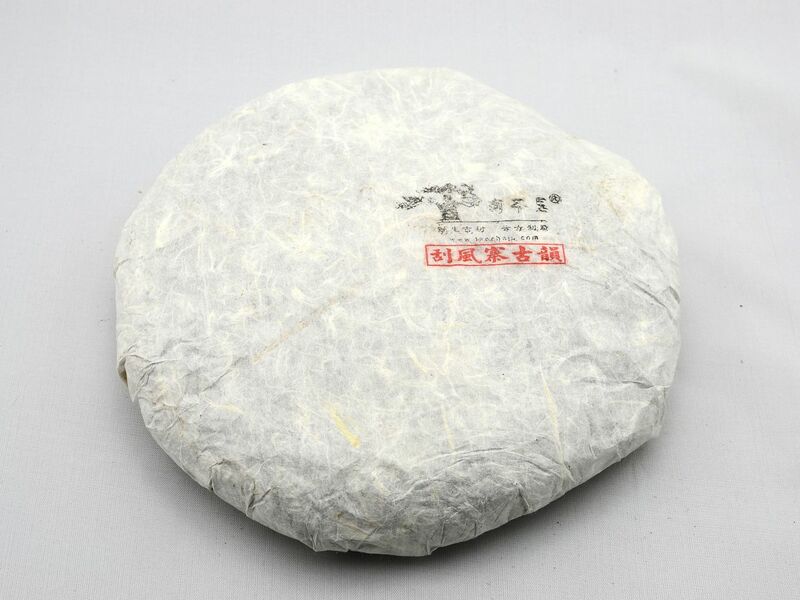 Like all Fangmingyuan cakes, they are well-made, and the leaves are lively, with a fresh, solid scent exuded from the wrapper. If I know very little about pu'ercha at the moment, I knew even less back then. That Tea Institute cake wasn't great, but my poor judgement has been somewhat ameliorated by the effect of aging on that cake's leaves. This Fangmingyuan cake suffers no such disadvantage. This is probably because Xiaodi picked it for me. When brewed, this has the anticipated nutty, almost longjing, hazelnut-like character that I noticed when I drank it in Beijing. It is tart, green, and strong. There is a problem with this tea, however. My teapot, Zidu, seems to hate it. He is not usually so objectionable, being an easy-going soul who is normally happy to brew whatever I give him. Occasionally, he will make his opinion known when he brews a tea that he truly loves - typically a good older pu'ercha - whereby he visibly shines, radiant in his purpleness. With this Jingmai, however, he kicked up a fuss, which is rare. In fact, he refused to brew it. Every time I cleared his spout, he would instantly block, making it impossible to extract the tea, and causing it to overbrew. This happened over, and over, and over again. Ultimately, I started again in a gaiwan - my celadon gaiwan, named Gertrude. She was much more obliging, but she is not quite as skilled with the brewing as Zidu. The result was sweet, but it was "brittle", and a bit sharp. "One dimensional - just bitterness", noted my dear wife. 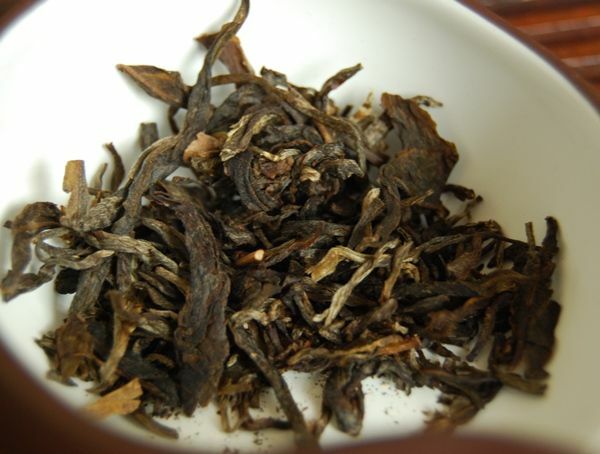 After sweet-talking and coaxing, Zidu later condescended to brew this for a short while, the results of which were closer to that nutty, sweet charm that I had in Maliandao. I don't think that this is a grand tea. Certainly, it isn't quite as good as Xiaomei's 2008 Bama, or the other Fangmingyuan cake that I bought from her this year, a Nannuo. However, it isn't priced particularly expensively, either - at 120 RMB, it is a good deal. I picked up a pair of them, to see if the effects of time can work some magic on the strong backbone characteristic of the leaves. P.s. It seems that Xiaomei is the only source on the Internet that sells the really rather special 2005 Yishenghao, currently 880 RMB. This is notably different, and better, than the various red/purple spring/autumn Douji cakes from the same year. Today, a cake from the eternal generosity of Keng, mighty Singaporean tea drinker and collector. 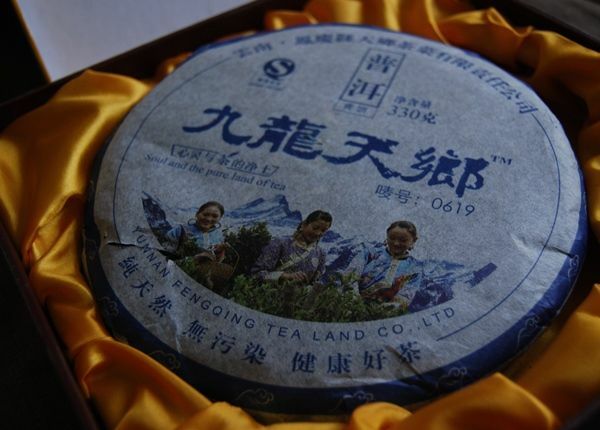 Yangpinhao is not Yangqinghao, but is a brand of which Keng has kindly sent me four other cakes over the years. They generally cut a good balance between price and quality. 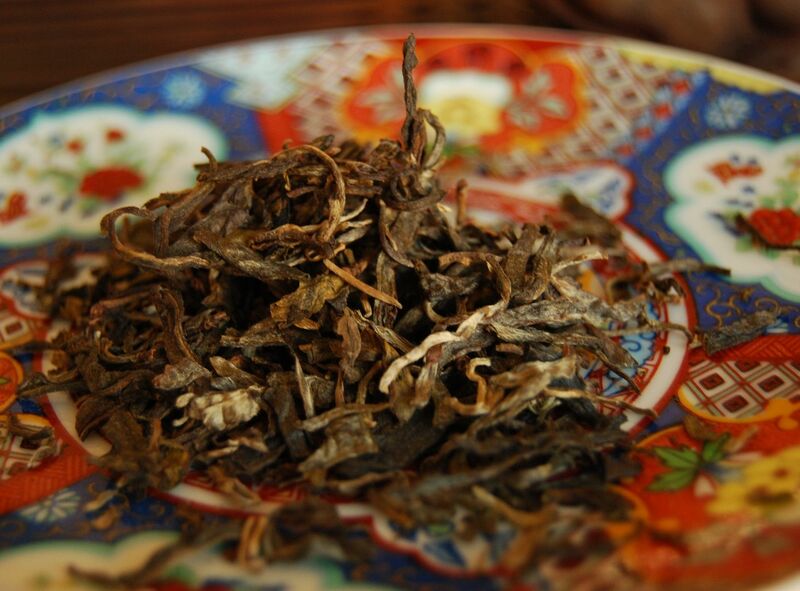 This is the first Nannuoshan version of this brand that I have tried. 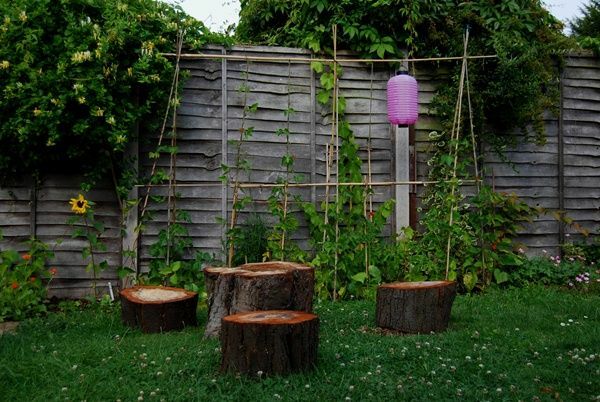 As you no doubt will know, qiaomu [cheeow-moo] refers to "arbor tree". 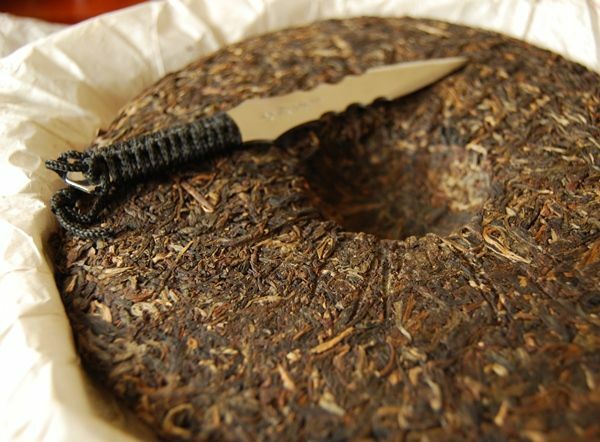 Yangpinhao cakes are easy on the eyes, and this Nannuo adheres to the rule, as shown above and below. the leaves are medium in size; are they slightly red? Something is amiss here, and it could be my nose. 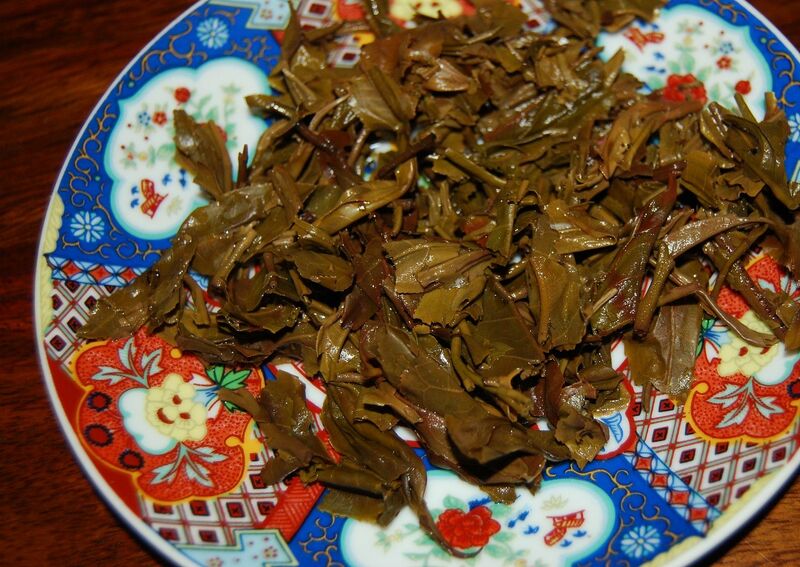 I can tell that the leaves have an aroma, for it feels dense and full in my nose, but it seems entirely invisible. I simply cannot smell it. This is an early-morning session and, unlike my dear wife, I have eaten no spicy food that might otherwise account for an inability to sense fragrant compounds. The colour of the soup, which I don't appear to have photographed, is a heavy orange, which is not usual for Nannuo. 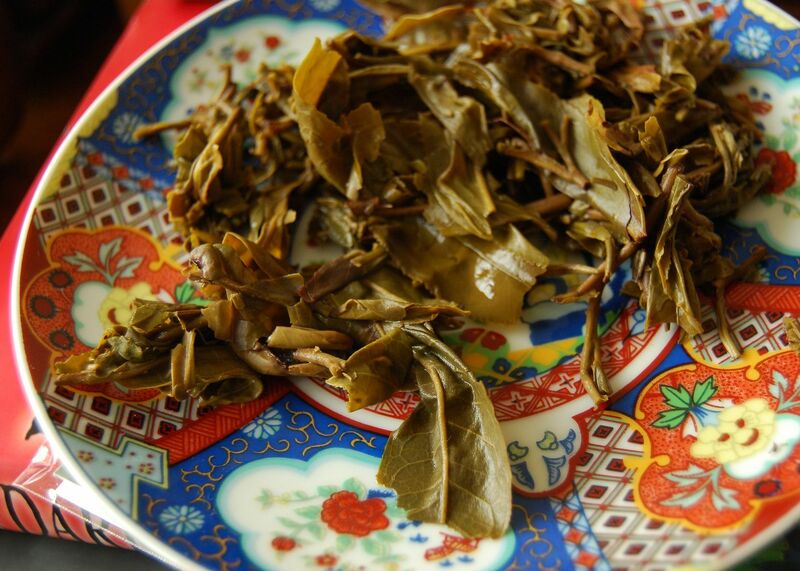 The flavour is that of a capped, limited taidicha [plantation tea], but it has a redeemingly potent activity in the mouth, and a pleasant tingling sensation that we sometimes find in laoshu leaves, suggesting that the "qiaomu" moniker may be true for at least some small part of the blend. I enjoyed its penetrating sweet bitterness that pushes its way through the mouth, and which suggests that good things may happen in future years. 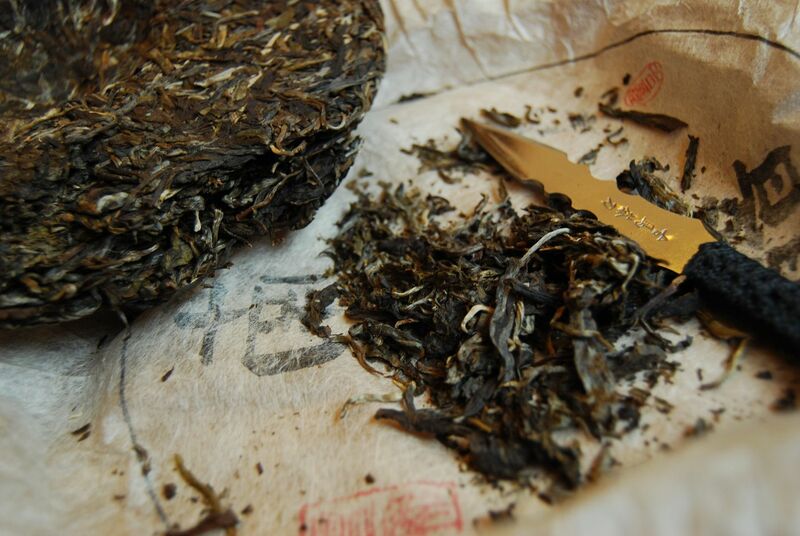 While not an exalted tea, in the manner of Yangpinhao, it is well-made and has a bold, strong character. It stays within this remit for its succession of infusions, which indicates a certain stability. Many thanks to Keng for so kindly selecting and posting this punchy little fellow. 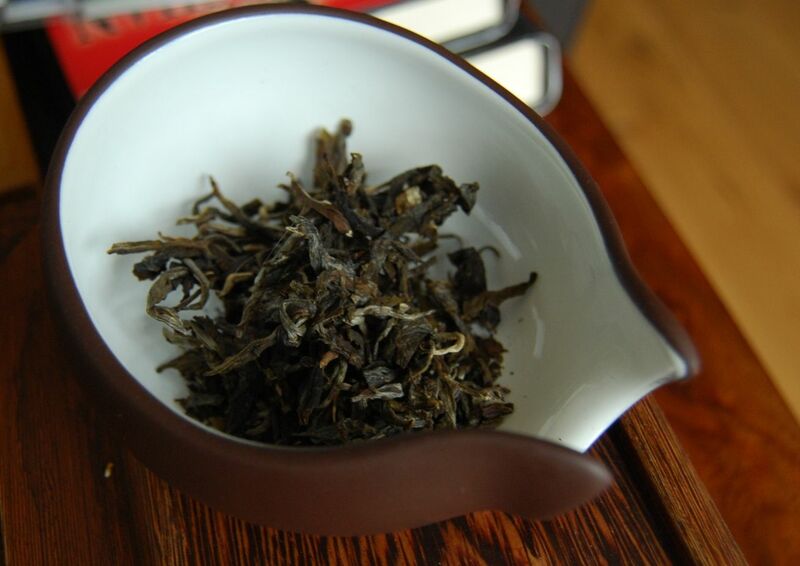 Next up in my catalogue of teas that make me cry for maocha that can never be is Xiao Yunqing's 2011 Guafengzhai. You knew it was coming - after the Laobanzhang, where else would you go? The scent of these small, little leaves is alluringly sweet. This is, basically, everything that's right about Guafengzhai (which is, of course, in the greater Yiwu area). 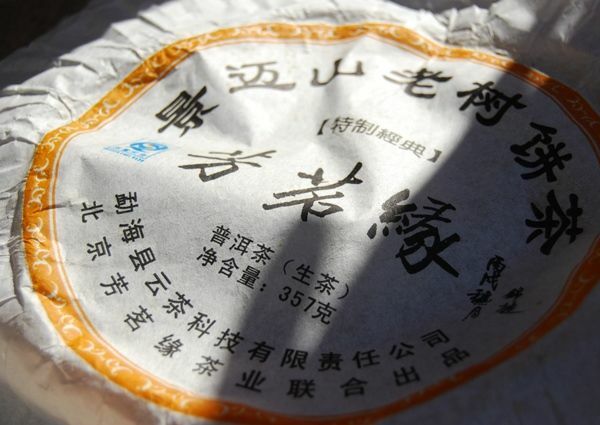 Like all good unaged laoshu maocha in my experience, this one opens into a bright yellow soup. It was at exactly this stage that I finally got fed up with my zisha cups and switched over to some white versions that we bought in Sichuan around five years ago. I should have made the switch ages ago. Density. Immense density. It sits in the mouth like a neutron star, its gravitational pull drawing water into the mouth, and sitting in the throat, refusing to be swallowed. It is fresh, vibrant green, and finishes with a hint of butter. It is absent all bitterness, but still piles on the huigan [returning sweetness]. "Really tasty - very good, and very cooling", notes Lei. It brews forever, sweet and long. 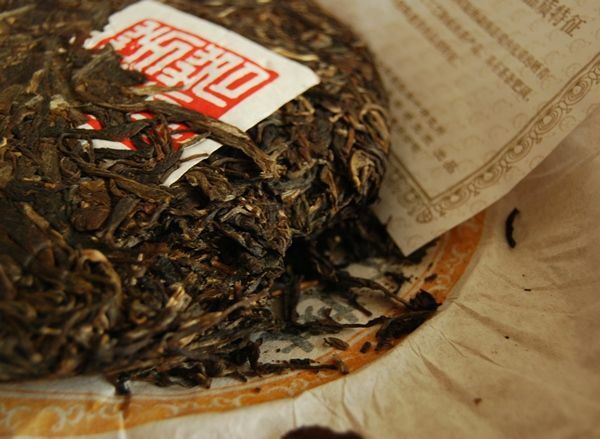 What a good Yiwu. 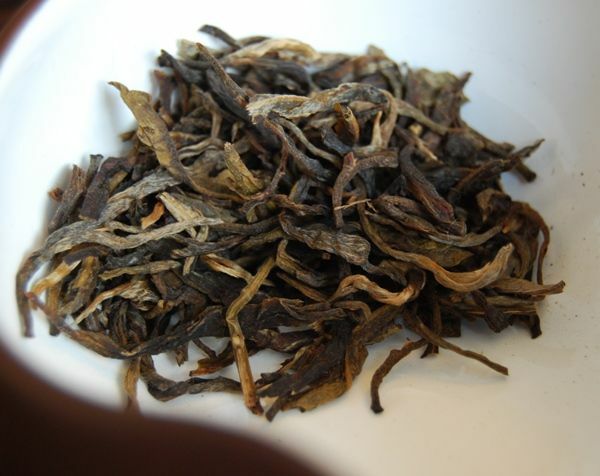 It's a landmark in taste, a great benchmark for comparison of other teas. 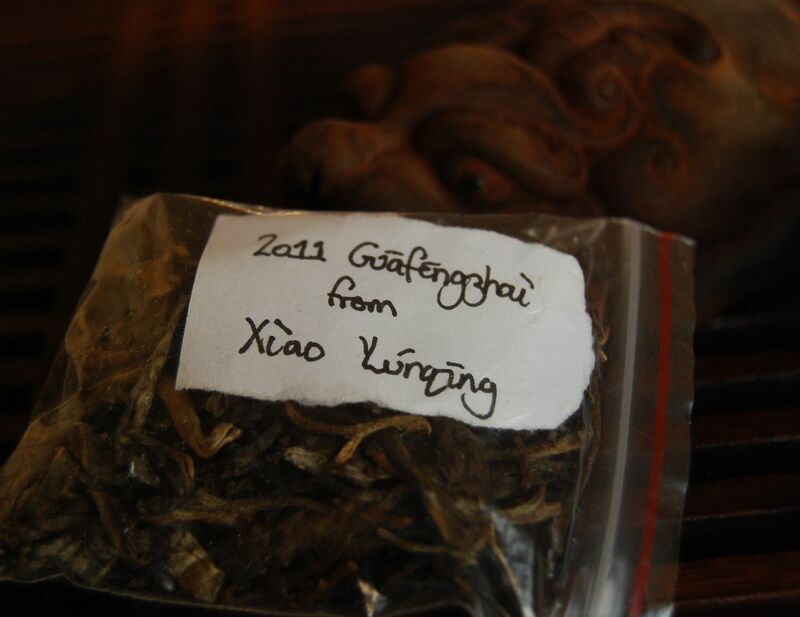 I am most grateful to Xiao Yunqing for the sample, which accounts for quite a large proportion of the leaves that he has remaining, such is his generosity. Don't forget to visit Taochaju when you go to Maliandao. 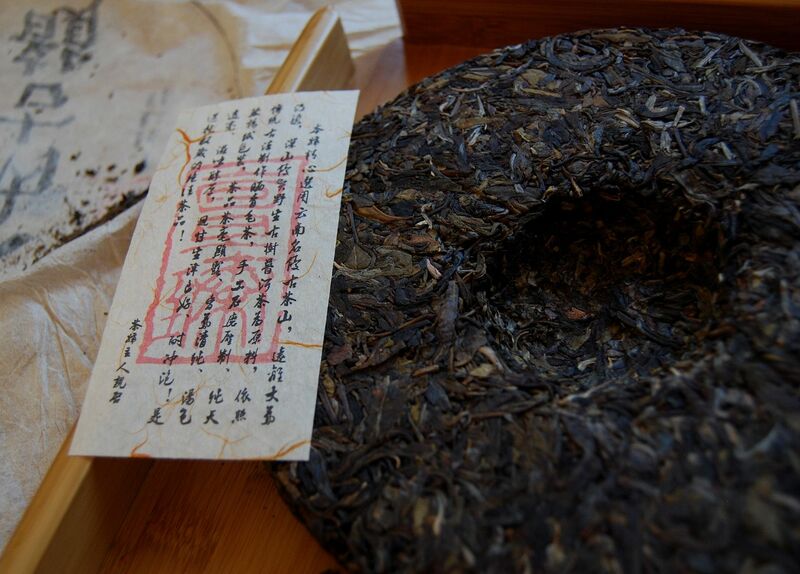 Many thanks to PM of white2tea for an opportunity to revisit this lovely cake from Xiao Yunqing. Both scent and character in the mouth begin slowly, but build to a dense finish that is sweet and mouthwatering. The third infusion eventually opens into a yet heavier sweetness, with a solid kuwei [good bitterness]. It is self-confident, self-contained, and does not over-reach; in these characteristics, and in its appealing jolliness, it is much like Xiao Yunqing himself. 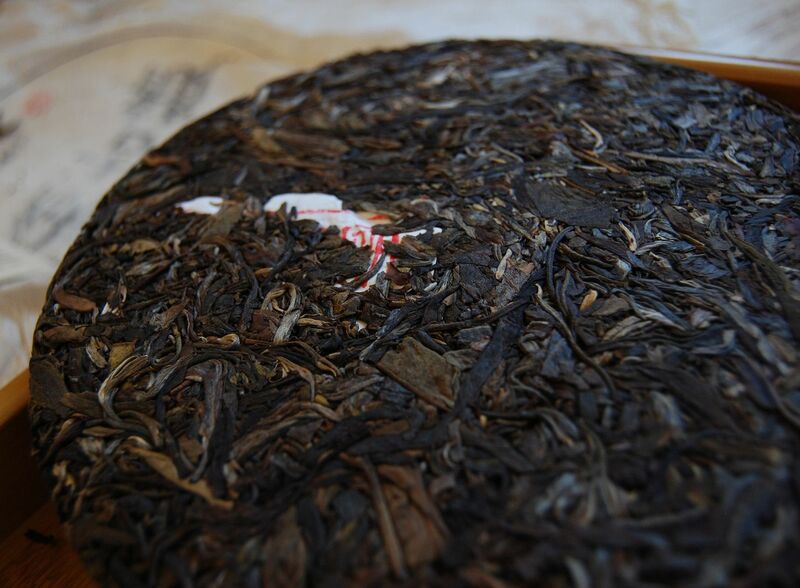 By the fifth infusion, the scent is fully-developed in the wenxiangbei [aroma cup], and the cake is moving along at full speed. That it takes quite so long to develop perhaps suggest that the leaves are strong, and that they have a good degree of content locked within, requiring time to unleash. Fun, well-crafted, with no hint of roughness or abrasion, it stays sweet and enjoyable long past a dozen infusions. 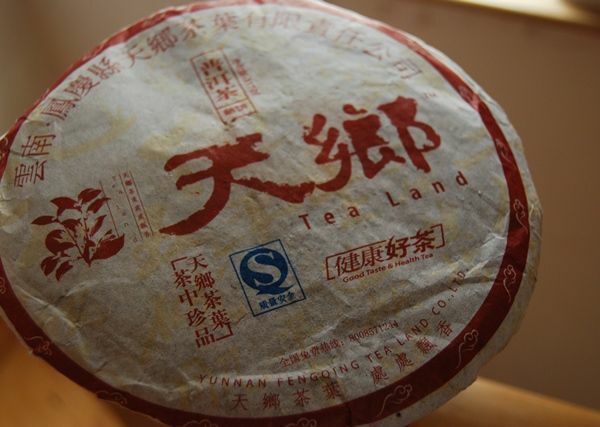 Perhaps its price-tag is / was rather high, maybe a little beyond its qualities, but it is a great little tea. 2008 EoT "Bulang Ancient Tree"
Yi Ho Yeong - Brother Anthony,s 2013 Ujeon? Sejak? Copyright of images and text is retained by Hobbes. Theme images by molotovcoketail. Powered by Blogger.